BullGuard is a leading company designed with an aim to protect everything in your digital life – from your data, to your identity, to your Smart Home. It not only offers fastest growing antivirus and security protection, but also partners with VPN specialist NordVPN to launch a new consumer anonymity solution – BullGuard VPN. This VPN allows you to surf the web anonymously and bypass web restriction from wherever you are. It can protect up to six devices simultaneously on all major operating systems. Check out the BullGuard VPN Review 2019 and learn how it works to make you get total freedom online. 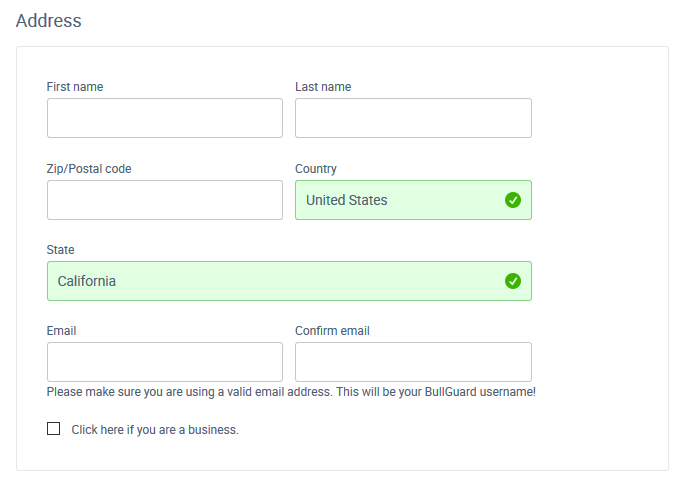 When it comes to the BullGuard VPN features, it is worth mentioning their one-click ‘Quick Connect’ feature which allows you to connect to BullGuard VPN server based on your preferences. There is also an ‘Auto-Connect’ feature which is used to identify open Wi-Fi connections. It automatically starts the VPN to ensure you are protected even if the Wi-Fi network is insecure. The internet is not a secure and private place, everyone can be vulnerable to data thieves, snoopers and hackers as long as they connect to the Internet. However, if you got BullGuard VPN, you will gain complete online security and privacy. BullGuard VPN can do more than concealing your browsing habits, it is a good helper for bypassing web restriction. For example, to prevent work-time distraction, many companies set up their egress firewalls to block social network sites, therefore, it makes their employees unable to access those sites from inside their network. And for political reasons, many countries set up egress filtering at their ISPs to block their citizens from accessing selected foreign web sites. The good news is these firewalls can be easily bypassed with BullGuard VPN. You even can use BullGuard VPN to easily access Google, Facebook, WhatsApp, YouTube and other websites that are blocked in China. BullGuard VPN has a fantastic customer support which is available 24/7 through live chat or email. If you have any problems about their service, you also can find the answer first from its detailed FAQ page. BullGuard VPN is an all-around security solution that gives user complete privacy and flexibility to safely and securely access the Internet. Get started today & Enjoy the flexibility to safely and securely access the Internet now! Depending on the subscription length, BullGuard VPN offers three plans for people to choose from: 1 Year, 2 Years and 3 Years. Here’s how much each subscription costs. 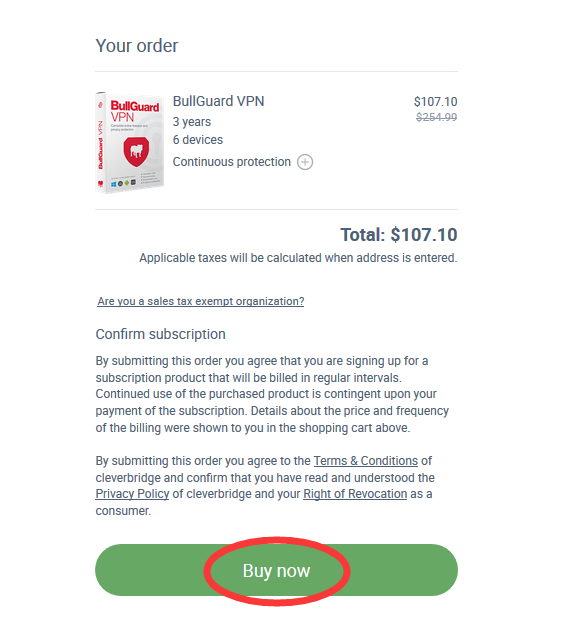 As the image shows, the price of BullGuard VPN is much higher than many other VPNs, however it’s an all-around security solution for the consumer cybersecurity market. It covers more than a simple VPN. You can get a wider range of products, including mobile security, identity protection, smart home cybersecurity, etc. Best of all, with your BullGuard VPN subscription, you can protect up to 6 devices at a time with no limits on data usage. The new BullGuard VPN makes customer get a secure and encrypted connections everywhere, thus ensuring their total privacy on the internet. If you are looking for a reliable, fast, and secure VPN provider, BullGuard VPN can be your preferred choice. Is there a discount for BullGuard VPN? Yes. 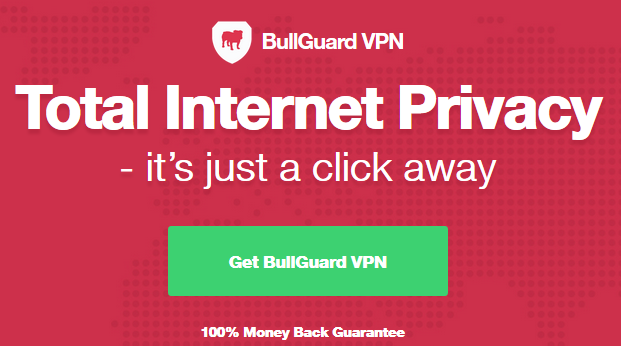 For people who care their online privacy and freedom, we are offering a special deal to make them join BullGuard VPN with a lower price. One can save 44% on BullGuard VPN 2-Year Plan, and 58% off on 3-Year plan relatively. Comparing with $7.08/month, 3-Year plan surely is the best deal for you and this is the lowest price available in this year. The plan is priced at $107.10 now, billed every 3 years. BullGuard VPN gives you 100% money-back guarantee so you don’t take any risks. To get this exclusive deal, you don’t even need a coupon code or promo code. All you need to do is to click our promo button and the discount will be applied automatically. Shield your data, unblock content and become 100% anonymous with BullGuard VPN now! 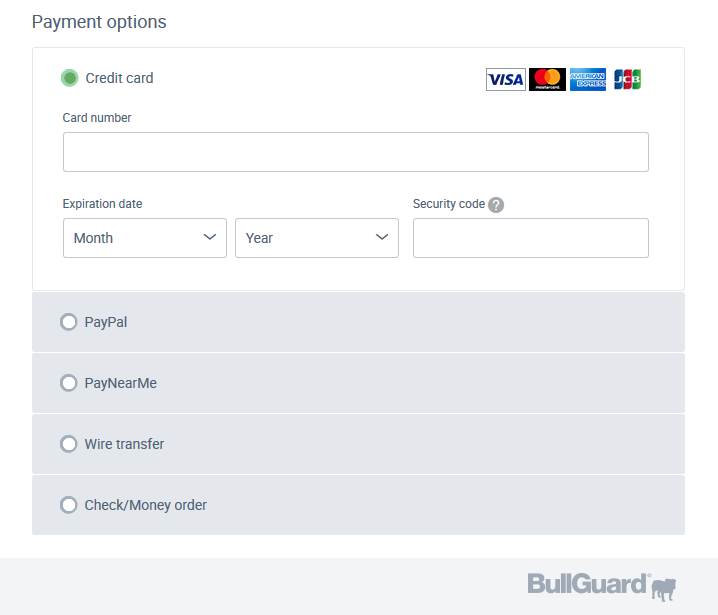 BullGuard VPN accepts all globally recognized payment options, ensuring you can pay how you want with peace of mind. It accepts payment methods ranging from credit cards and PayPal all the way to Wire Transfer, which is not supported by most other VPNs. BullGuard VPN also accepts Check/Money order, and PayNearMe which allows you to make a cash payment. So after submitting your order, you will receive a link to the PayNearMe website to complete your payment. You can pay with cash at your nearest 7-Eleven store using a PayNearMe card (mobile phone required) or a PayNearMe slip. Join to the BullGuard family with millions of users to experience complete online privacy and total Internet freedom now! Hide your Internet activities from your ISP. Congress has allowed Internet Service Providers (ISPs) to sell and share user’s browsing histories, it goes without saying that your online privacy is no longer safe anymore. BullGuard VPN is a good way to enhance your privacy in an era of loosened regulation. It can hide your true location making your browsing anonymous and also encrypt your Internet traffic with military-grade encryption. In this way, your ISP cannot see what you are doing online and they have no idea what websites you open and what data that you send and receive. Bypass web restrictions in office/school/college. Educational institutions or work place usually offer Wi-Fi connection to people who need it as the internet has become central to 21st century academia. However, for a variety of different reasons, their Internet connection is not open. Sometimes you may find a wide range of websites and services are blocked on their network. This censorship is irritating. But with BullGuard VPN, one can get around online censorship and gain complete privacy and security. Stay safe on a public Wi-Fi. Free public Wi-Fi is incredibly convenient, but security can be an issue. Using public Wi-Fi is a risky thing. If you don’t take precautions, the personal information includes bank account details, passwords, credit card info or sensitive email contents on your devices could be sent over a public Wi-Fi network to a hacker for illegal use. BullGuard VPN makes use of 256-bit AES encryption to secure your connections to public WiFi servers. This protocol has been subjected to countless amounts of cryptanalysis, so you know you can rely on it. It’s also a well-known military-grade encryption protocol. All in all, BullGuard VPN will simply ensure that you are browsing the web in a secure and private manner. Hide your real IP address and browse anonymously online. An IP Address, like any address, is a powerful thing when known. It can be used to identify where you are in the world, restrict content, or track you online. By knowing your IP address, ISPs and the government can target ads at you, block you from accessing overseas content, put you under surveillance or censor you. BullGuard VPN can assign new IP addresses for you. In other words, as soon as you connect to its VPN network, your real IP can be hidden and you’ll be assigned another IP address, making you are from other locations. BullGuard VPN ensures you an anonymous browsing. It prevents online tracking by the Government, advertisers and cybercriminals for you. Unblock streaming video and social media website. Torrenting without a VPN is just asking for trouble. BullGuard VPN is suitable for BitTorrent. It helps people stay private online and hide their uploads and downloads, making torrenting safely and anonymously. Having difficulties with BullGuard VPN? 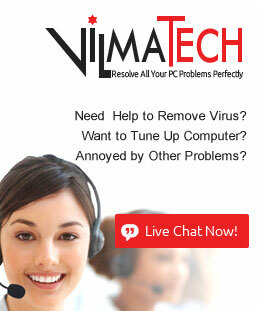 Don’t hesitate to get in touch with their support team. BullGuard VPN offers live chat support with representatives that are professional, and knowledgeable. But they are not 24/7 available. If you come from France, Germany, Denmark, Sweden, or the Netherlands, live support will only be provided during the 9:00 AM-5:00 PM period. Also, you can contact can them via Email. BullGuard promises they will get back to you within 24 hours. It seems BullGuard VPN social accounts on Facebook and Twitter are much more active and will answer your questions faster. The community forum is always full of people; the blog is constantly being updated with fresh articles. There’s a big FAQ section on the official website and numerous manuals that will help you out with easy and straightforward guides. How to Get Started with BullGuard VPN? 1. Go to BullGuard VPN page here and click on the green”Get BullGuard VPN” button. 2. Choose your favorite plan and click “Proceed to Checkout” to go further. 3. Enter your information including your name, zip code, country and email address to create an account. 4. Choose your preferred payment options and fill in your information. 5. Click “Buy Now” to confirm your payment. 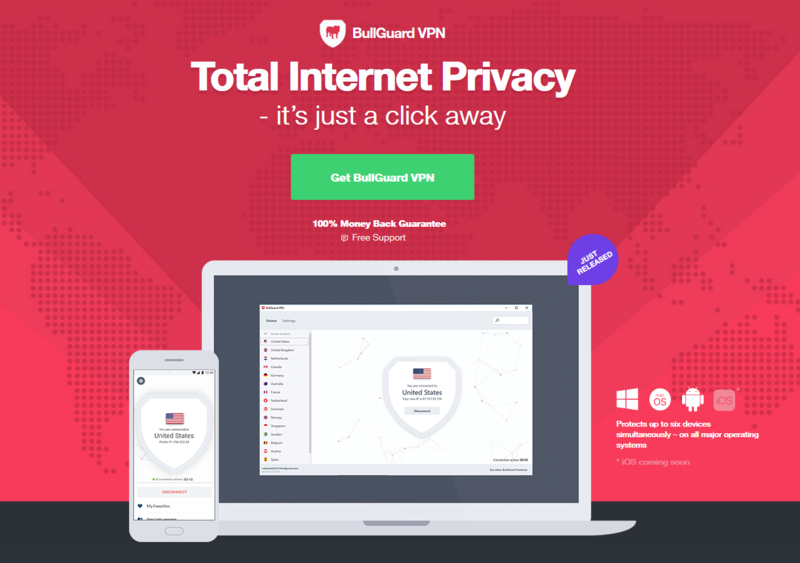 BullGuard VPN is a new and all-around advanced solution developed by the multi-award winning consumer cybersecurity company BullGuard and its partner NordVPN, which is the most advanced VPN services in the world. This best-in-class VPN network infrastructure enables customers to safeguard their online privacy in a fast, seamless way from their desktop or smartphones, wherever they go. Currently BullGuard VPN is available for Windows, Mac, Android, and its iOS version is coming soon. Since it was just released, it still needs some improvements. BullGuard VPN only offers servers in 16 countries. The number is not large when it is compared to other providers, however BullGuard is able to unblock Netflix and Hulu for every country, including the US and UK. Moreover, BullGuard provides its users with unlimited bandwidth and lets people watch their favorite shows, wherever and whenever they want. BullGuard VPN uses military grade encryption to encrypt your data, keeping it away from the prying eyes of ISPs, cyber criminals, and government surveillance. With the service, you can unblock most popular social networks like Facebook, Twitter, Instagram and even all the Google services from anywhere of the world. You can watch your favorite HD movies and TV shows on YouTube, Netflix, BBC iPlayer without buffering. BullGuard VPN is giving customers a good opportunity to grab its fastest VPN with a whopping discount up to 58% off from the regular price. So, you can explore the web without restriction as low as $2.97/month. For this price, it covers all the basics for online safety and surfing, so BullGuard VPN is still worth it.